The 13-year-old is already one of the best basketball players in the country. LeBron James has been making headlines right and left for his numerous entertainment projects, his move to the Los Angeles Lakers, and the groundbreaking school he just opened in his hometown, but he isn’t the only one in his family doing big things. 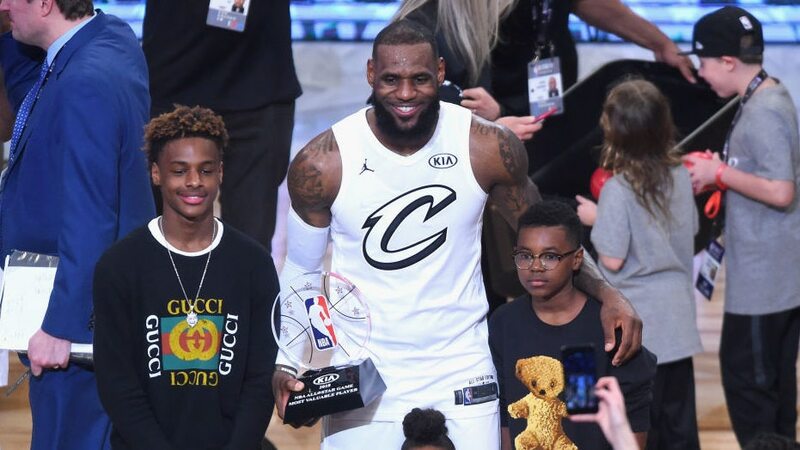 According to several reports, his son, LeBron James, Jr. (Bronny) is following in his famous father’s footsteps by standing out from the crowd as a basketball phenom at only 13 years-old. The teenager is heading to the prestigious Crossroads High School in Santa Monica, a breeding ground for major talents. LeBron James Jr. to attend Crossroads HS (Santa Monica). He will not be eligible to play varsity. Since Bronny is only entering the eighth grade, he still has his eye on the basketball team but will have to wait until next year to plan on the varsity squad. Alumni of the high school include a long list of celebrities like Baron Davis, Jack Black, Kate Hudson, Gwyneth Paltrow, Maya Rudolph and Jonah Hill among others. Shaquille O’Neal‘s son, Shareef O’Neal, recently graduated from the school where he averaged 27 points per game his senior year and is now heading to UCLA to play basketball. It seems there’s a lot to celebrate in the James house these days, despite Donald Trump‘s recent rant against the incredible NBA star. His new docu-series, Shut Up and Dribble will premiere on Showtime in October and is described as “an inside look at the changing role of athletes in our fraught cultural and political environment, through the lens of the NBA’ according to Deadline. The title is especially appropriate considering the dustup the phrase caused when Fox News deplorable, Laura Ingraham, made some severely insulting statements about King James and his activism a few months back. He has done more than prove that fact on numerous occasions, particularly last week when he opened a school in Akron Ohio that puts this country’s education system to shame. The I Promise School is the culmination of nearly a decade of work by the foundation, with its focus on educating children from challenging backgrounds who need and desire additional educational support. The school will begin with two grades – third and fourth – with plans to expand in the coming years.